The day was finally here... It was Wednesday July 9th and Abe and I were both off work. I had most of our stuff packed the night before so today was about relaxing, doing last minute packing and making sure we had everything we needed! We decided to get to the airport early to make sure we had no problems at all. We load up the car to head out and I do a double check around the house to make sure we have everything we need. I grab a few things on the way out and lock up and then head out. I walk to the car and look around and realize I do not have my purse! My purse just so happens to have both of our passports in it... as well as our HOUSE key. I started to panic just a bit. My best friend no longer had a key to my house and my landlord was not answering the phone. After 10 minutes of freaking out, I remember one of my good friends had a key to my house and I called her and she had it on her and she was 10 minutes away from us. We headed to her and grabbed the key. We managed to get back, get my purse and get things locked up again within 30 minutes. We got the airport at around 2 and got through security in no time. Our flight was on time and it was leaving at 5:30. We had some time to wait around in the airport. We got to our gate and got settled in for the long wait. We ended up watching a movie while we waited. 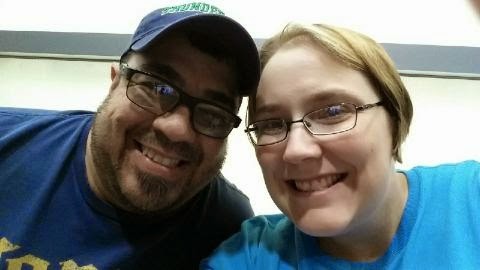 This was Abe and I at the beginning of our travel day... Ready to get there and enjoy some time together!